Conor Cooney in action in last Sunday’s win over Antrim. Photo by Daire Brennan/Sportsfile. 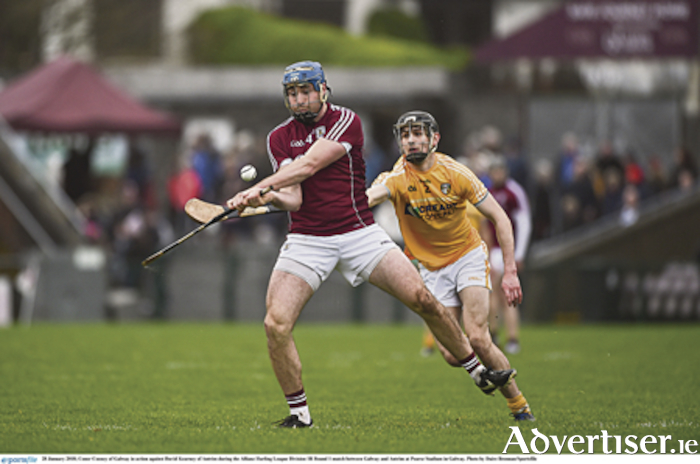 The Galway hurlers follow up their opening day narrow 1-19 to 1-16 win over Antrim with a trip to O’Moore Park on Saturday evening (7pm ) for a round two clash with Laois. It is a game the All-Ireland champions will be expected to win with some ease, and anything but a solid win would be a big surprise, even without such key players as team captain David Burke and Joe Canning who will not be back in the county colours until later in the league. Laois were beaten by 10 points last weekend by Limerick, 1-25 to 0-18, while Galway were u nderstandably sluggish after a few months of inactivity. In front of some 4,000 supporters at Pearse Stadium, they were behind going into the last 10 minutes and looked in danger of starting their league campaign on a bum note. Needing to score seven of the last eight points to edge out the Ulster men, they finished with three-point winning margin, with Cathal Mannion and Conor Cooney hitting the last few points. Team manager Micheal Donoghue admitted his side was lethargic and took a long time to get moving to a high standard. “I was worried to be honest,” he said. “With five or six minutes to go, the game was there to be won and Antrim weren’t going away, testament to them. They brought everything to it. The learning curve for us is that we know now that is going to happen every week and we have to be ready. “We’re at a stage where we have acknowledged we are behind the pack a bit in terms of our preparation, and we have to use these games to look at some of the extended panel. Lads have to understand when they get the opportunity, they have to take it. Brian Concannon, who was making his debut, hit the goal for the home side just before half-time and they led narrowly at the small whistle. Antrim then hit 0-4 without reply to edge in front by three when Galway upped their work-rate. Their superior bench started to make a difference with John Hanbury and Eanna Burke settling the league and All-Ireland champions. Two more subs, Davy Glennon and Cathal Mannion, also made a big impact and were factors in Galway getting their first two points in division 1B. After such a scare last weekend, the management team will be looking for a much more focused and improved display this Sunday. Scorers for Galway: C Cooney (0-6, 4 frees, 1 ‘65 ); B Concannon (1-1 ); J Cooney & E Burke (0-3 ); N Burke, P Flaherty, M Dolphin, J Hanbury, D Glennon and C Mannion (0-1 each ). Galway: J Skehill, M Donoghue, D Burke, J Grealish, A Tuohey, M Dolphin, A Harte, J Coen, E Burke, N Burke, J Cooney, P Flaherty; B Concannon, C Cooney, J Flynn. Subs used: C Mannion, S Loftus, G McInerney, C Mannion, J Hanbury, D Glennon.